With its tangy flavor, Greek yogurt is the perfect swap for sour cream in this caramelized onion dip. Enjoy it as healthy game day snack or take it to your next party! 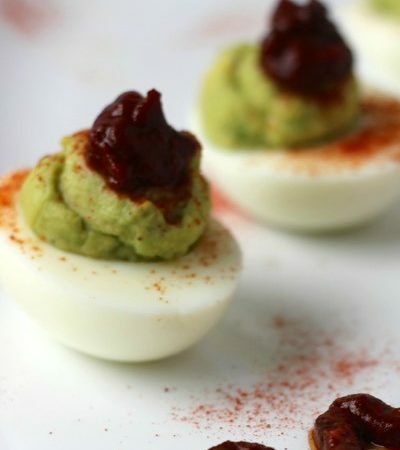 This is a retro snack with a modern, healthy twist. Back in the day, French onion dip with chips was a staple at parties and baby showers. This is a throwback to those times. It’s a little more fancy and a lot healthier. Instead of gobs of sour cream this recipe uses protein packed Greek yogurt as the creamy, cool base. It delivers just enough tanginess that your guests will never know the difference. It’s all balanced by the sweet, savory goodness of slow cooked caramelized onions. This recipe is incredibly easy. You’ll need to invest a little time upfront to caramelize the onions but believe me – the aroma is totally worth it. When the onions are done, you simply mix everything together in a bowl and serve it up. I paired the dip with exotic vegetable chips this time. 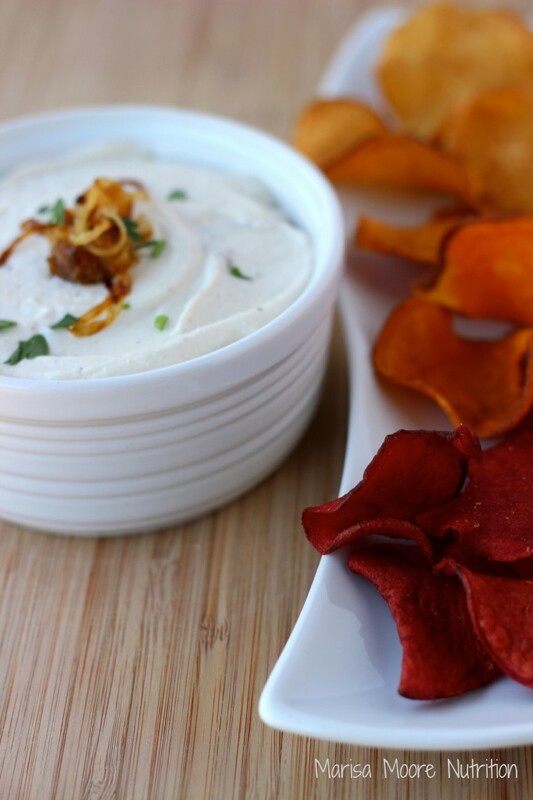 The salty, crunchy potato chips against the creamy, caramelized onion dip was a little addictive. Caramelize the onions. Add the olive oil to a cast iron skillet or stainless steel sauté pan. Cook the onions over medium heat until fragrant and caramelized. Once caramelized, deglaze the pan with 2 tablespoons of vegetable broth, water or white wine. Remove from the heat. Let cool. Make the dip. Combine the caramelized onions with the remaining ingredients in a bowl. Stir to combine. Serve with your favorite fresh crunchy vegetables or beet, carrot or sweet potato chips. * Refrigerate any leftover caramelized onions. Enjoy them on sandwiches, on pizza or folded into an omelet.